We stayed over for a day at Omarama. We didn't like the town all that well  its main reasons for existence seemed to be sport fishing, gliding from the little airport, and Merino sheep (statue below). But we needed to catch up on this website, do some laundry, and other exciting stuff. The sunset below was taken from the campsite. This campsite is where we met interesting Americans from Maine who had sailed to New Zealand and decided to stay. They bought a home on the Banks Peninsula by Christchurch and only recently sold their place on Mt. Desert Island. The big challenge soon after leaving Omarama on Monday, the 14th, was Lindis Pass. It wasn't as hard as we'd feared, perhaps because we were psyched up for it, but when we went down the far side, we were glad not to be pedaling in the opposite direction! It looked much harder going north. At the top of the pass, we checked the cellphone and found a message from Rollie and Mary. They knew we were close by and were on the lookout for us. With big, fast descents from the pass, we made good time to Tarras. 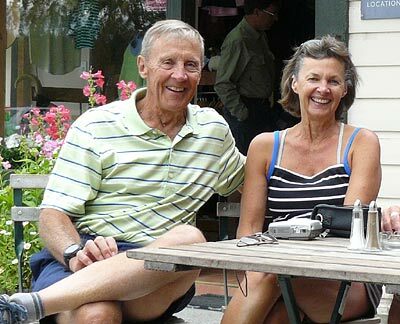 There, while we were sitting outside a cafe talking with an American man and a German woman who were teaching in Invercargill, Rollie and Mary drove in. It was great to see them. Unfortunately we sat around talking for too long, and it started to rain. Rollie and Mary drove on to Cromwell to check out camping options, and we followed in the wet. They met us on the outskirts of town and led us to the best choice  a very big holiday park loaded with fruit pickers, mostly young people from all over the world. 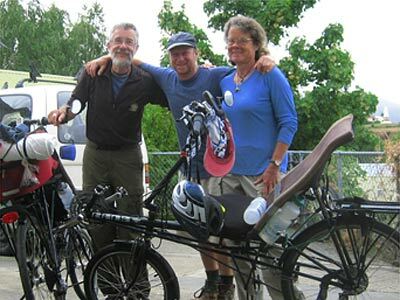 By the time we reached Cromwell, we had ridden over 110 kilometers. Mary, not surprisingly, came up with a good dinner for us and we had more time to talk. Fortunately the rain stopped before the sun went down, and it turned sunny once again. Rather than stay in Cromwell the entire time, we decided to ride on Wednesday to Wanaka and stay with a Servas host, Daniel Goldstein. The ride was quite beautiful, though somewhat hilly. With a hot breeze in our faces, it was a little like riding in a convection oven. There were many orchards and vineyards along the way; we pigged out on fresh cherries. Finally we arrived at Lake Wanaka. There were many vineyards and orchards along the way from Cromwell to Wanaka. 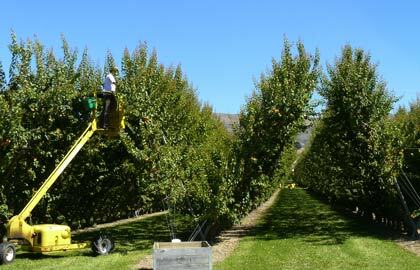 On the left, a man is picking either apricots or nectarines. 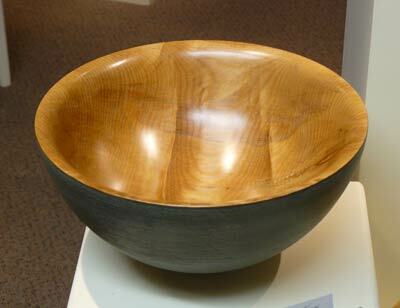 We've visited several crafts and art galleries on our rides. 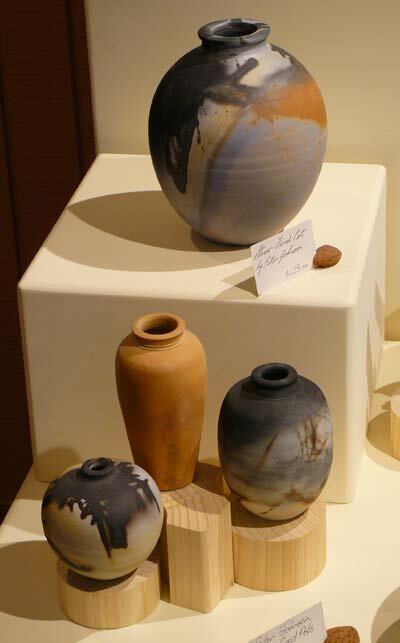 The Wood Gallery, a few kilometres outside Wanaka, was one of the best, specializing in wood turning and pottery. Not only was the work fine, but the presentation and indeed the entire gallery space was beautifully designed. Daniel Goldstein, our Servas host in Wanaka, turned out to be a really nice guy. He had an attractive little house with a view of the lake and its mountain backdrop. Daniel immigrated to New Zealand from Uruguay several years ago, and he works as a builder. Unfortunately we were able to stay with him only for Wednesday night because we had to ride back to Cromwell on Thursday for Wally's dental apointment first thing Friday morning. We were sorry not to have spent more time at Daniel's and at Lake Wanaka, but we will be passing through this way again on the way to the west coast, so we will visit with him then. 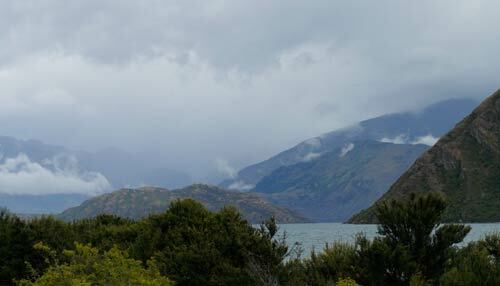 On Thursday morning, when we were preparing to leave Wanaka, it was drizzling, then turned partly cloudy, with glimmers of sun. Before actually departing, we spent an hour or more riding on a beautiful path along the lake. The town centre is highly developed and quite touristy, but the lakeshore path was a delight and the lake and its setting are gorgeous. At first the ride back to Cromwell was easier and faster than the trip out; we were generally losing elevation with a tailwind. But the afternoon heated up and the wind turned against us, so we took a fairly long break at a shady spot on the shore of Lake Dunstan. When we got back to the holiday park in Cromwell where we had left some of our things, we were somewhat surpised and very disappointed to find that the food we had left behind had been either thrown away or eaten. (Eaten, we hope.) So instead of an easy evening, we had to make more trips for groceries and Barb cooked another good but late dinner in the communal kitchen.